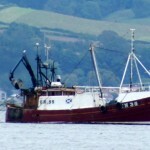 The 20 meter long fishing vessel Amy Harris caught fire off the Isle of Arran, Scotland. The fire started in the vessel’s engine room and cutoff the crew from wheelhouse. The crew was able to contact the Coastguard by a mobile phone. A helicopter was dispatched to the scene. 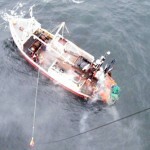 The four crew were winched to safety and were taken to Campbeltown. No reports of injuries. Reports state the authorities were monitoring the adrift fishing vessel. No further details reported.